So I actually combined a couple of recipes together. I used Tartelette’s Pillow Cheesecake with Salted Butter Caramel and The British Larder’s Peanut Honeycomb idea. I like the idea of making rustic desserts lately. Throw everything on top and make it homey, country-ish, rustic instead of placing every bit of decoration precisely on every 1/12 of the cake. OK maybe I’m just lazy sometimes. We could appreciate some “rustic”ness sometimes right? Even better when sauce / chocolate / cream flows down by the side of the cake… !! OK If you realized, it’s the same plate from the Piece Montee. Ok lar I don’t have much flat plates to work with. Anyways, forget me mentioning that, let’s get back to the cake. For the cheesecake base, I followed exactly in Tartelette’s recipe. It’s actually a shortbread base, not sponge, not digestive biscuits, neither crackers. Preheat the oven to 350F / 175 C.Work the butter, sugar, flour and cacao with a food processor or your fingers to get a sandy mixture. Work the dough for a minute. Divide the dough in half. Reserve one half to make shortbread cookie or refrigerate for another time. Press one half into the bottom of a 10 or 12 inch springform pan. Bake for 40 minutes.Let cool completely. *make sure the butter is very cold, put in the freezer after you’ve cubed it small. Well I actually just used half of the entire recipe because I probably won’t be making cookies or any other cakes with it any soon, knowing that this cake would feed us quite a bit. But it makes a nice shortbread if you wanna have some extras for afternoon tea. Combine the cream cheese, butter, sugar, lemon zest, creme fraiche and cornstarch in the bowl of a stand mixer and whip until combine. Do not incorporate too much air or the cake will crack. Make sure the cream cheese and butter are very soft. Add the egg yolks one at a time and whip just until combined. Whip the egg whites until stiff. Gently fold them in the cream cheese batter. Pour the batter over the chocolate shortbread crust. The batter will reach the rim of the cake. Wrap your springform pan with heavy duty aluminium foil, set it in a large roasting pan, add enough hot water to come up halfway up the side of the pan. Bake at 325F / 160 C for 1 1/2 hours. Turn the oven off, crack the door of the oven open and let your cake cool in there for 30 minutes. Remove from the oven and refrigerate completely for a few hours or better yet overnight. The cheesecake was baked, cooled, chilled. Then I made the salted butter caramel sauce and peanut honeycomb. For the salted butter caramel, Hahaha I tell you, I still have half a container left. I basically use it for my vanilla ice cream, or even cupcakes!! and secretly, cream puffs. 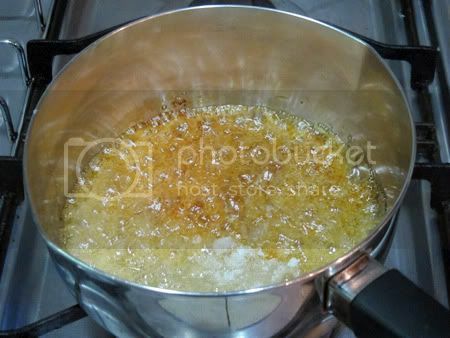 In a heavy saucepan set over low heat, combine the sugar, salt and water and heat just until the sugar is dissolved. Add the butter. 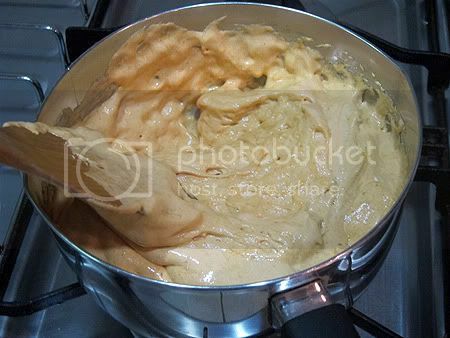 Let it come to a boil and cook until it reaches a golden caramel color. Remove from the heat and add the cream ( it will splatter and get crazy, but do not fear and trust the recipe). Whisk to combine and put back on the stove. Let it come to a boil again over low heat and cook 10-15 minutes until you reach a nice creamy consistency. Pour into a jar and try to refrain yourself from drinking it! At this point, (if you’re actually reading from the top) you’d probably think, so tedious or so “mahfan” (means tedious in chinese) or “why can’t I just bake the cheesecake?”. I’ll tell you what, it’s just so worth it to have a little more condiments or entremets or something extra to go along with it. The salted butter caramel sauce could be just sufficient for the luscious cheesecake, but I wanted to have a little more texture to it, hence the peanut honeycomb, from The British Larder. Scatter the salted peanuts over a parchment lined baking tray and set aside. Remove the pan from the heat, add the bicarbonate of soda, stir quickly as the caramel will bubble vigorously and expand (2nd bottom pic), quickly pour the frothing mass over the salted peanuts and leave to cool completely. 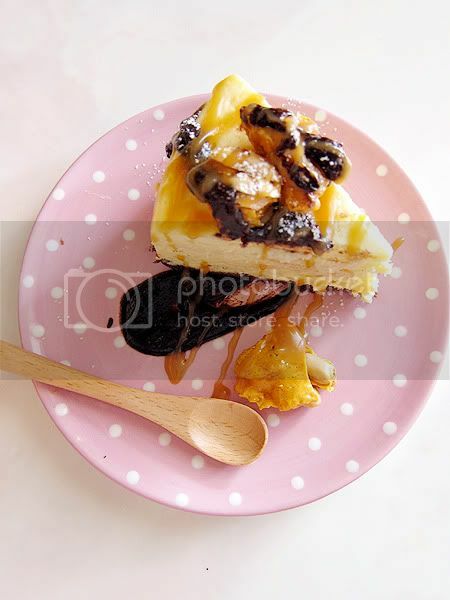 To assemble, remove cheesecake from springform pan onto a plate or serving dish. 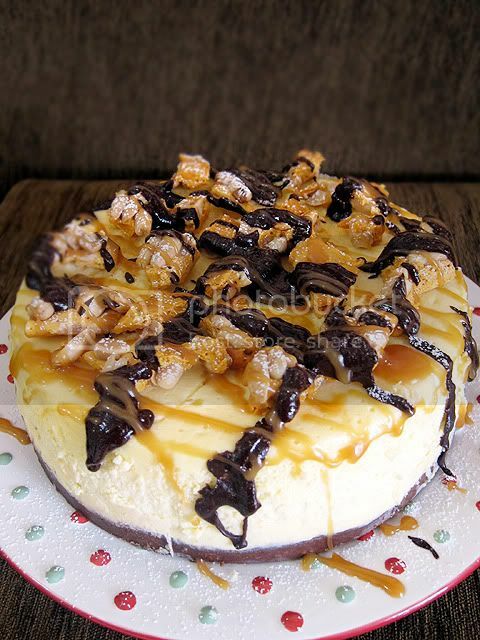 Break peanut honeycomb and scatter all around on top of the cheesecake. Melt some chocolate over bain marie or in the microwave on low heat and drizzle on top. Then fill in caramel sauce in a piping bag or plastic, then cut a small hole at the corner edge of the plastic, and drizzle all over the cake. Be artistic with it ok. HAHA ok I’m kidding. Then sprinkle some icing sugar, well, for some rusticness. I would say, it fits a 12″ pan much better, though the lightness of the cheesecake texture wouldn’t refrain it from being taller than other baked cheesecake, but it just cooks faster and more evenly. 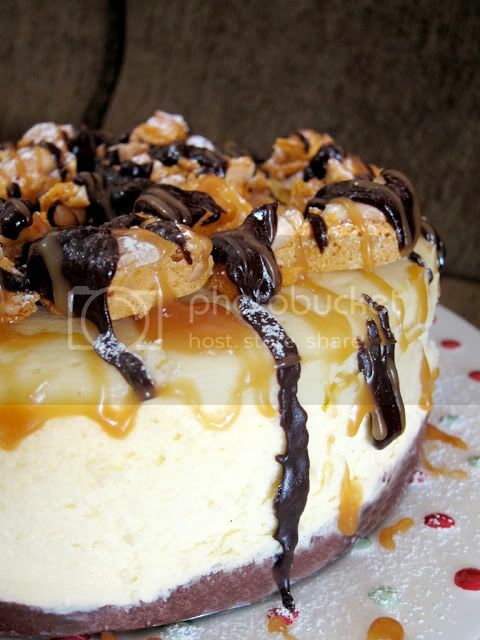 My husband is addicted to Caramel and this would just make his year if I made this. Thanks for making the directions so clear. I must try this and let you know how it turns out. It looks so dense…just how I like it!! I eye marked the Tartelette's recipe for quite a while. But I'd say, separating the whites for cheesecakes really make it more fluffy and less dense. More to our Asian tastebuds. American styles where only 1 egg per block of cheese is used is way too dense, I find. Nowadays I always separate my whites for all my cheesecakes. thanks for the recipe! looking at the pictures kinda gave me the creeps, so sinful but irresistable! Ooohhh…..Swee San, so many of us have been making baked goodies with peanut butter lately! They are amazing when combined with chocolates! I love the last pic, that pink polka dot plate is chic and funky! And yeap, when it's all piled up and messy, we called it rustic and old-fashioned! Wow wow wow! YUM! This looks incredible! This looks amazingly good and so, so sinful. 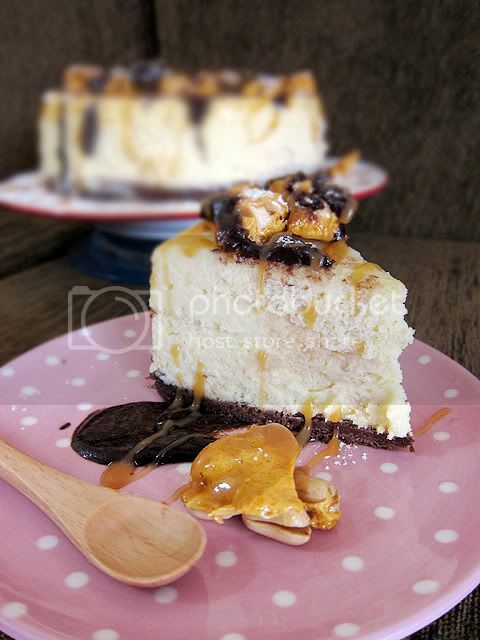 My hubs would love you for this recipe cause cheesecake is his weak (not sweet .. haha) spot!